I don't know what the weather is like in your area, but right now it's cold, snowy, and miserable in southern NJ. 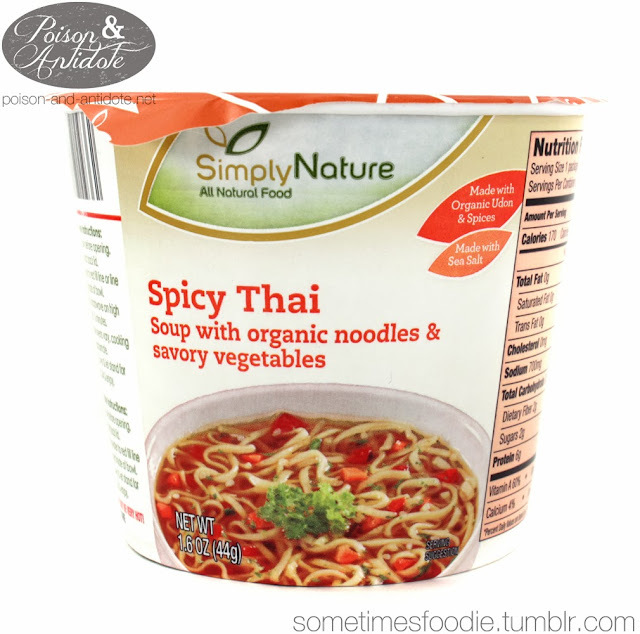 I figure that this is the perfect time to review some spicy instant soup! The packaging is simple, and typical for a instant soup product. All we have is a cardboard cup (with some waxy/plastic coating) and a paper lid. Nothing fancy, but it works. As for the design, the color scheme and layout are pretty sophisticated, but it feels more like an American or European product than a Thai one. I have had Thai instant noodles before, and the packaging is usually very bold with bright colors and imagery. If this design is meant to appeal to the American market, I feel like it's a success. If not, Aldi needs to spice this product up a bit to better represent the origin of the product. I peeled back the lid to add the boiling water. Now, I don't buy cup-style instant soup very often, so I could be wrong, but the contents look proportionally off. Look at that tiny chunk of noodles in comparison to all that seasoning! The instant Thai style noodles I have eaten before came with several packets, an oil, dried veggies, and a soup mix. This version has everything (sans oil) loose in the container, so it isn't as customizable. I added the boiling water, folded the lid, and let it sit for the recommended 7 minutes. When the time was up, I peeled the lid off and the soup was filled with little flecks of herbs and veggies. It looked pretty appealing for an instant soup, and it smelled like herbs and garlic. I wanted to dig right in! 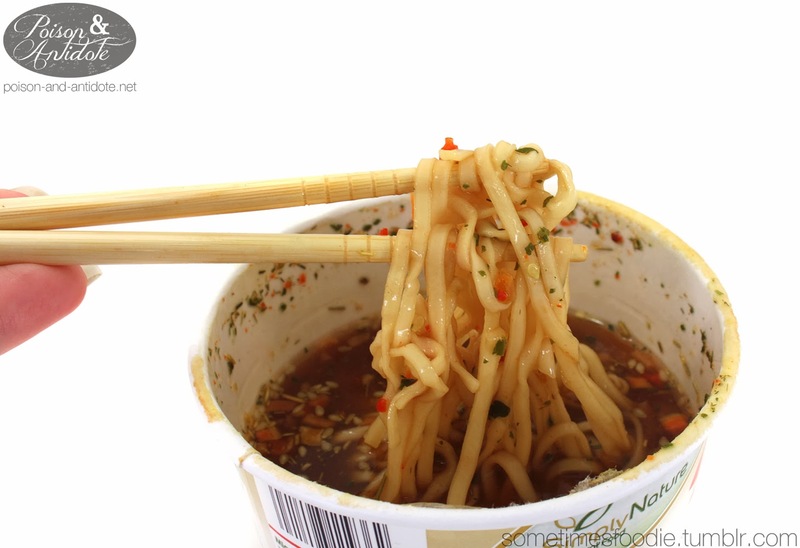 I grabbed my chopsticks and gave it a try, but to my dismay, this was really bland. Was something wrong? Am I too accustomed to spicy foods? 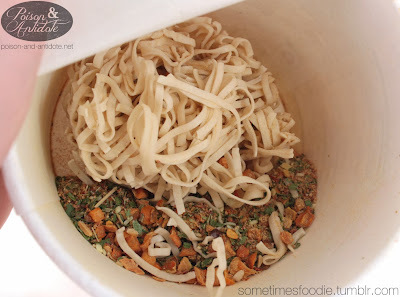 The noodles were visually covered with herbs and dried veggies, but there was barely any flavoring. Plus, this was supposed to be spicy! Where's the spice? I took a few sips of the broth and apparently that is where all of the flavoring is. The broth is a little spicy, garlic-y, and savory, but no where near as spicy as I thought it'd be. After about 4 chopsticks-worth of noodles, there were no more noodles to be found and I was left with the chunky, herb-filled, broth. Due to all the sodium, 700mg, I didn't want to drink it all, but the broth was the tastiest part of this product. I found this in the special buy section of Aldi, so I don't know if it is still available, but I wouldn't recommend it. You can go to any Asian grocery store and get a cheaper, and more filling, instant Thai-style noodles.